Difference between revisions of "Ephrata Cloister (Ephrata, Pennsylvania, USA)"
Ephrata Cloister was established by the Seventh-day Baptists at [[Ephrata (Pennsylvania, USA)|Ephrata]], Lancaster County, Pennsylvania, a group which separated from the Dunkards ([[Church of the Brethren|Church of the Brethren]]) in 1735, headed by [[Beisel, Johann Konrad (1691-1768)|Johann Conrad Beissel]]. They were a mystical group who organized a communal life, separating the sexes and binding themselves to a simple life, in effect establishing a Protestant monastery. Rudolph Naegle, a Groffdale (Lancaster County) Mennonite preacher, and other Mennonites with names of Landis, Lang, Meylin, Graff, Weber, Greybill, Funk, Eicher, Hildebrand, Hoehn, and Martin joined them. Soon the group owned all lands within a radius of three or four miles, farmed the lands of Cocalico, and built an industrial center with a gristmill, sawmill, paper mill, oil mill, and fulling mill, a tannery, and weaving and pottery factories. They were musicians, teachers, did excellent <em>[[Fraktur (Illuminated Drawing)|fraktur]]</em> work and embroidery, painted on walls and canvas, were spinners, quilters, and makers of household remedies, sulphur matches, and waxed paper. They established one of the earliest German printing establishments in the New World in 1745. Source: "Architecture." STUDYBLUE website. 13 September 2013. Web. 2013. Ephrata Cloister was established by the Seventh-day Baptists at Ephrata, Lancaster County, Pennsylvania, a group which separated from the Dunkards (Church of the Brethren) in 1735, headed by Johann Conrad Beissel. They were a mystical group who organized a communal life, separating the sexes and binding themselves to a simple life, in effect establishing a Protestant monastery. Rudolph Naegle, a Groffdale (Lancaster County) Mennonite preacher, and other Mennonites with names of Landis, Lang, Meylin, Graff, Weber, Greybill, Funk, Eicher, Hildebrand, Hoehn, and Martin joined them. Soon the group owned all lands within a radius of three or four miles, farmed the lands of Cocalico, and built an industrial center with a gristmill, sawmill, paper mill, oil mill, and fulling mill, a tannery, and weaving and pottery factories. They were musicians, teachers, did excellent fraktur work and embroidery, painted on walls and canvas, were spinners, quilters, and makers of household remedies, sulphur matches, and waxed paper. They established one of the earliest German printing establishments in the New World in 1745. As friends of mercy Ephrata cared for soldiers after Braddock’s defeat and the Battle of Brandywine. The Mennonite preacher John Baer and his wife, who had come to help in the care of soldiers who were sick with typhus, died with the 150 soldier victims of the disease. With the best press and the only good paper in America they produced 43 books, the largest of which was the German Martyrs' Mirror (in 1748) for American Mennonites. Their Ludwig Hacker had a Sunday school here 40 years before Robert Raikes’s in England. Peter Miller, the talented prior 1743-96, founded the Ephrata Classical Academy, translated the Martyrs’ Mirror from Dutch to German, and translated the Declaration of Independence into seven languages. In 1789 he interceded for the First Amendment to the Constitution of the United States which guarantees religious liberty, and freed a Tory, his worst enemy, walking barefooted to West Chester via Valley Forge, to appeal to General Washington. The State of Pennsylvania has established the Ephrata Cloister as a shrine, and is restoring all buildings to their original form. The Ephrata Cloister press was of much service to the early Pennsylvania Mennonites, particularly in the first half of the 18th century. The following Mennonite books were printed here: 1745 Güldene Aepffel; 1745 Das Andenken einiger heiligen Märtyrer; 1745 (also 1770, 1785) Die Ernsthafte Christenpflicht; 1748-51 Märtyrer-Spiegel; 1769 (also 1770) Christliches Gemüthsgespräch; 1787 Das Ganz Neue Testament (Froschauer). The translation service of Peter Miller for the Märtyrer-Spiegel was of very great value. This tremendous folio volume of 1,482 pages in fine calf binding was an extraordinary achievement in those pioneer days in a frontier wilderness village. It was the largest book published in the American colonies before the Revolutionary War. Hege, Christian and Christian Neff. Mennonitisches Lexikon, 4 vols. Frankfurt & Weierhof: Hege; Karlsruhe; Schneider, 1913-1967: v. I, 595 f.
Sachse, J. F. The German Sectarians of Pennsylvania 1708-1742, A Critical and Legendary History of the Ephrata Cloister and the Dunkers, 2 vols. Philadelphia, 1899, 1900. Landis, Ira D. "Ephrata Cloister (Ephrata, Pennsylvania, USA)." Global Anabaptist Mennonite Encyclopedia Online. 1956. Web. 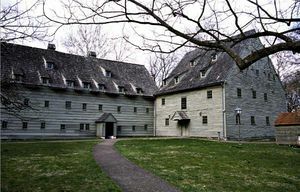 22 Apr 2019. http://gameo.org/index.php?title=Ephrata_Cloister_(Ephrata,_Pennsylvania,_USA)&oldid=101545. Landis, Ira D. (1956). Ephrata Cloister (Ephrata, Pennsylvania, USA). Global Anabaptist Mennonite Encyclopedia Online. Retrieved 22 April 2019, from http://gameo.org/index.php?title=Ephrata_Cloister_(Ephrata,_Pennsylvania,_USA)&oldid=101545. Adapted by permission of Herald Press, Harrisonburg, Virginia, from Mennonite Encyclopedia, Vol. 2, pp. 229-230. All rights reserved.